It was back in 2013 that my brother Max and I first paddled into Cliff Lake. 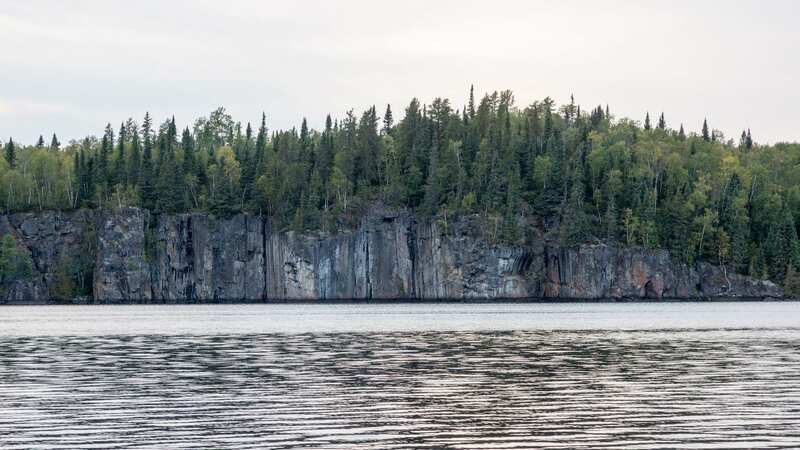 It was near the end of a memorable three-week 350-kilometer trip that had started on the west side of Wabakimi Provincial Park at Rockcliff Lake, close to the headwaters of the Misehkow River system. In Max’s mind, it is the best trip we’ve ever done! 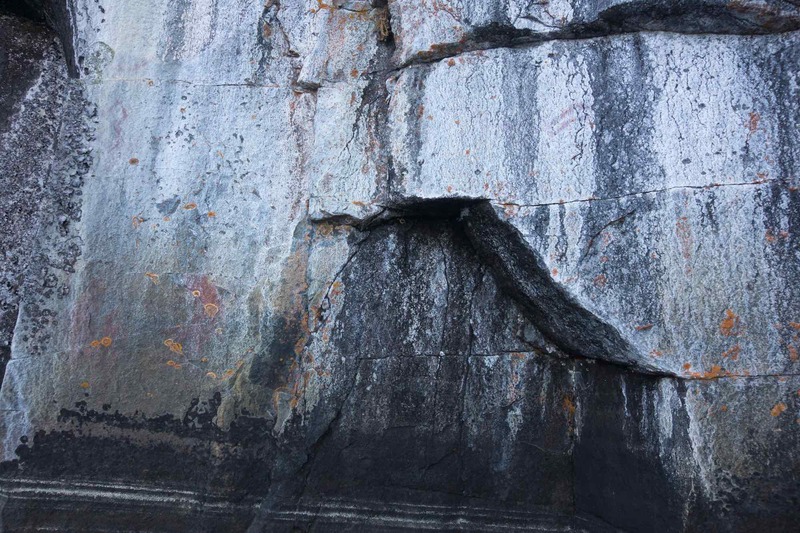 Among the many highlights of that trip, Cliff Lake and the stretches of dramatic vertical rock face lining its shores left an unforgettable impression. 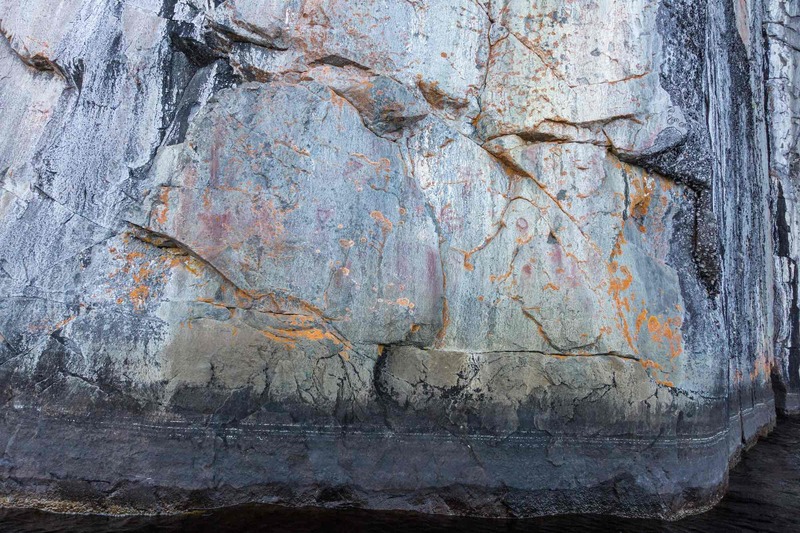 This September we returned for another look at one of the boreal canoe country’s largest collections of Anishinaabek pictographs painted on six different stretches of rock on the lake. While we appreciate our GPS devices, we like to have a paper copy of the day’s route in our map case. 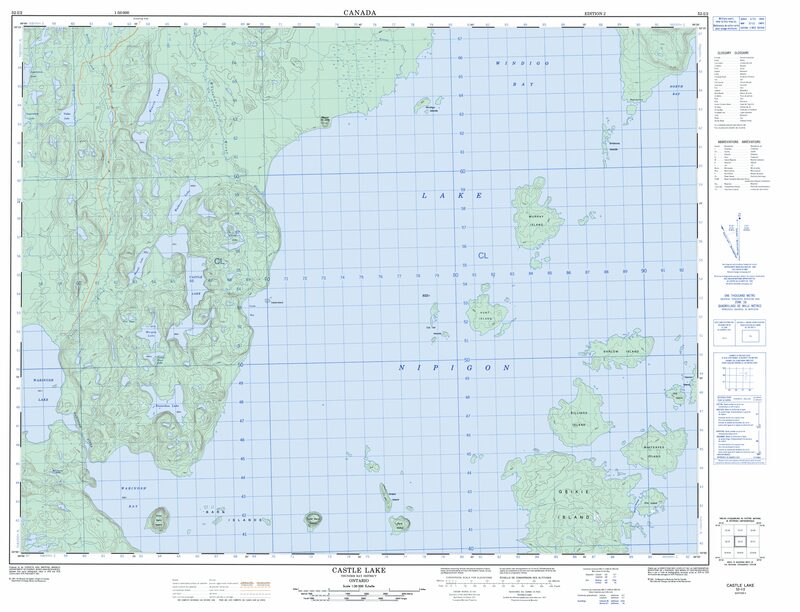 We print the relevant sections of the 1:50,000 topographical maps published by the Federal Government’s Natural Resources Canada department. 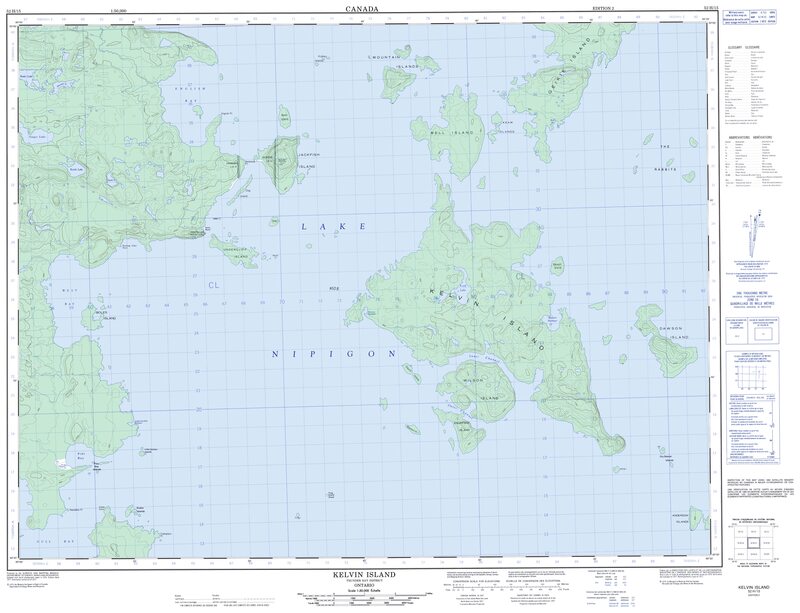 Click on the titles of the various map sheets to access jpg copies. 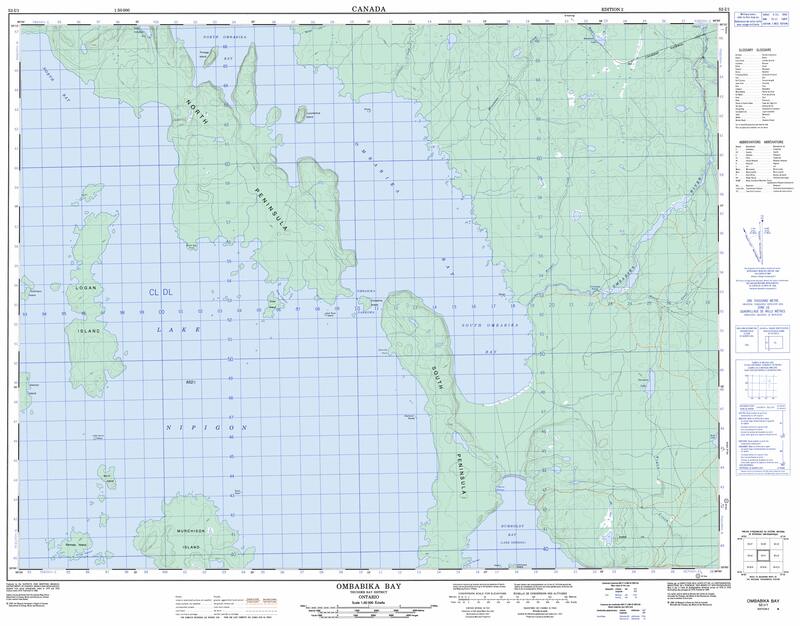 You can also download the maps – larger file size in a tif format – from the Govt of Canada server. Start with this webpage – toporama/50k_geo_tif/ – and go to the 052 folder. 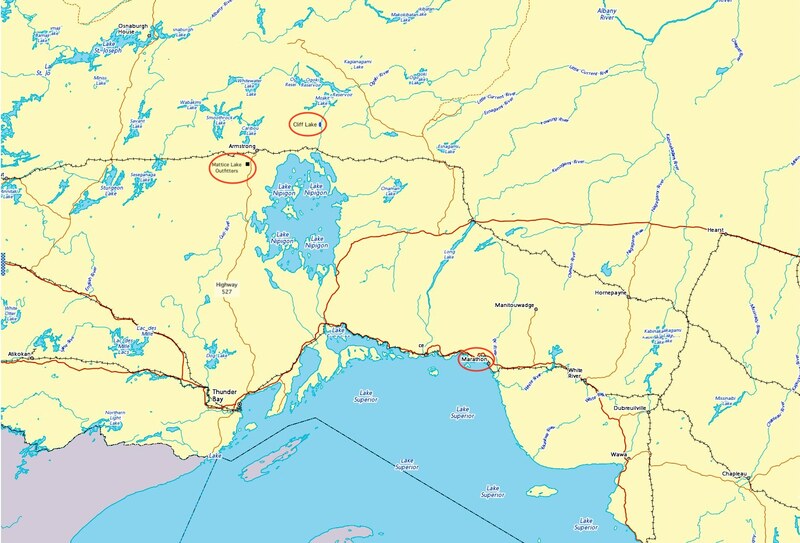 Also used were paper copies of a couple of pages of the Wabakimi Project‘s Volume 5 map set – Lake Nipigon Northern Tributaries (Wabinosh River to Little Jackfish River). 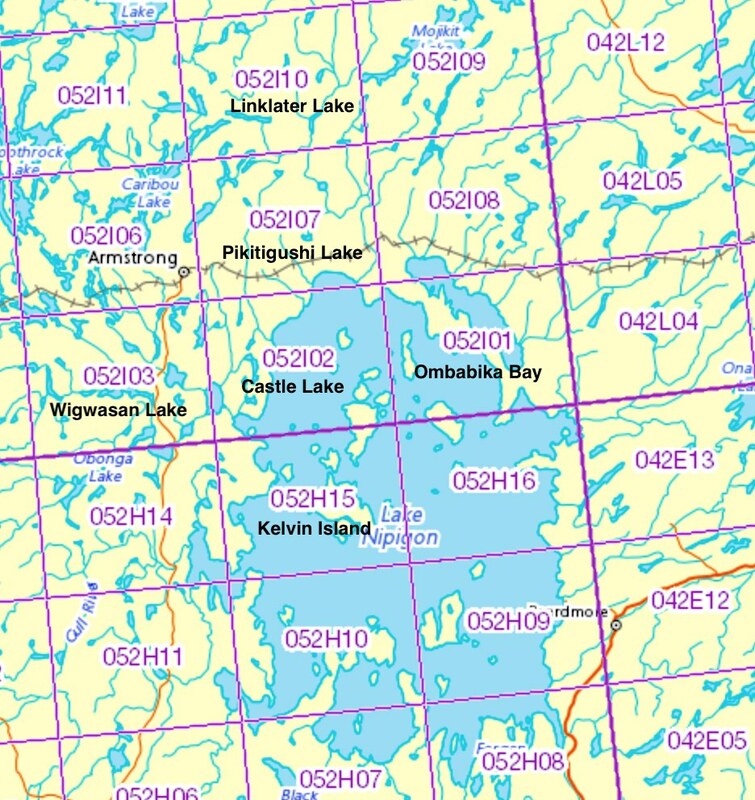 Just published last year, it has the info we needed for the last two days of the trip – i.e., the stretch from Wabinosh Bay up to Wabinosh and Waweig Lakes. Our Garmin GPS devices – my brother’s Etrex 20 and my Oregon – both have the Garmin Topo Canada map set installed. Once or twice a trip, they help us figure out exactly where we are! 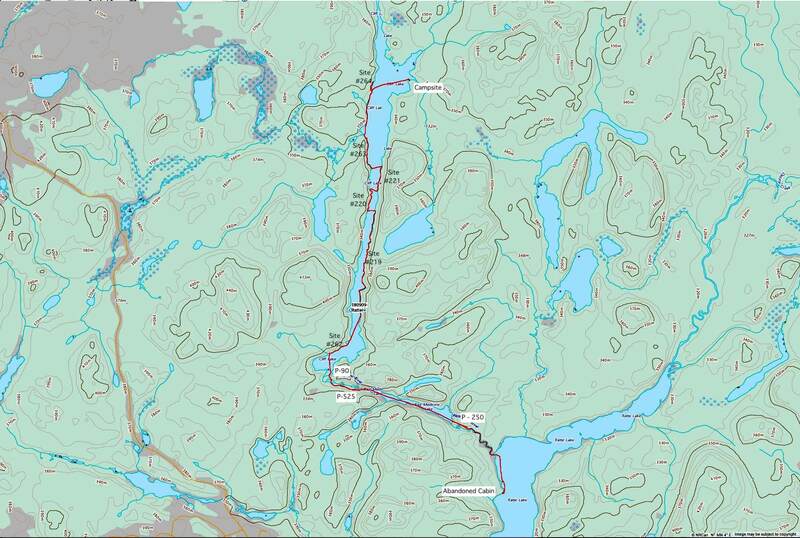 They also record an exact day-by-day track of our route with distance and other variables calculated. It is not everyone’s thing, but we love the stats! We also returned to Cliff Lake with the bittersweet knowledge that, of all the lakes in the Wabakimi area, it was the favourite spot of the legendary Phil Cotton. Phil was born in Hamilton but his family moved to Thunder Bay when he was fifteen; he would stay in the area, working as a music teacher for forty years at various schools including Port Arthur Collegiate Institute. Summers were for his other passion – canoe trips on the region’s many lakes and rivers, often as a YMCA guide and leader. On retirement, Phil spent his remaining years advocating for the Wabakimi area. 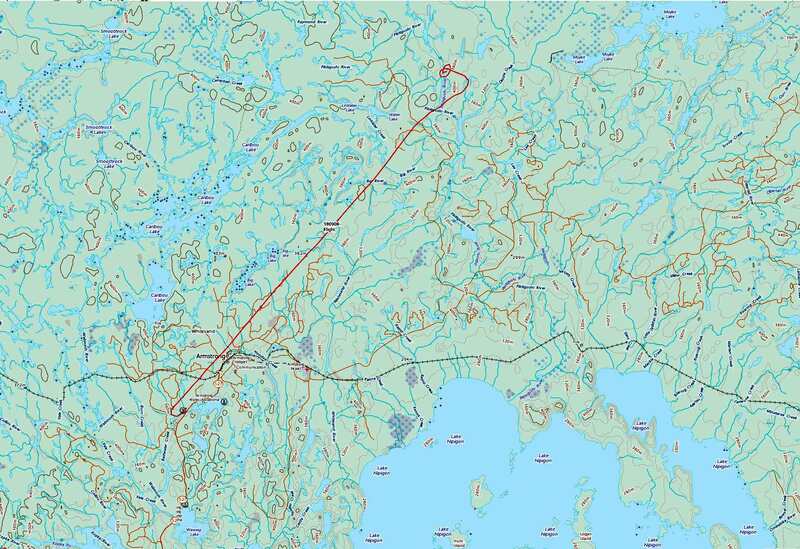 See the map above for the mammoth task he took on through his Wabakimi Project. 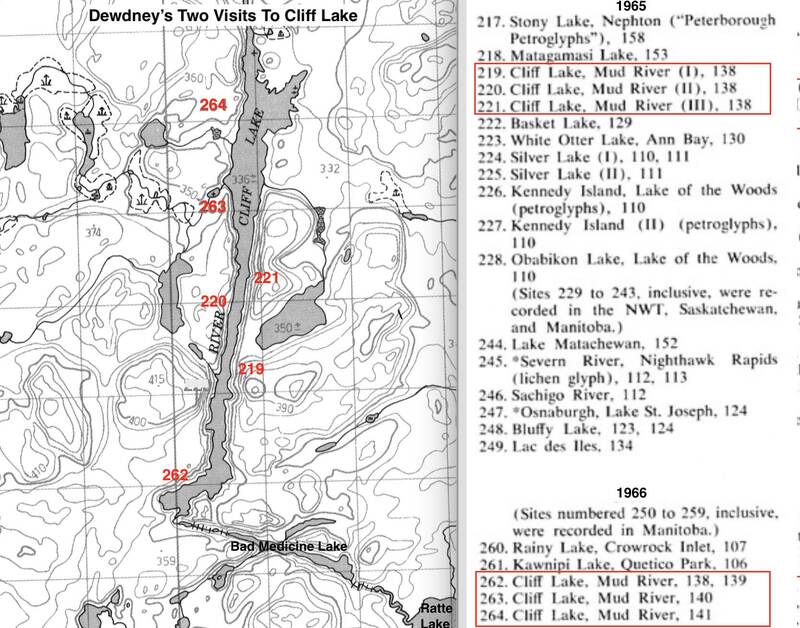 and providing canoe trippers with the necessary up-to-date maps which covered the Park and the surrounding area. 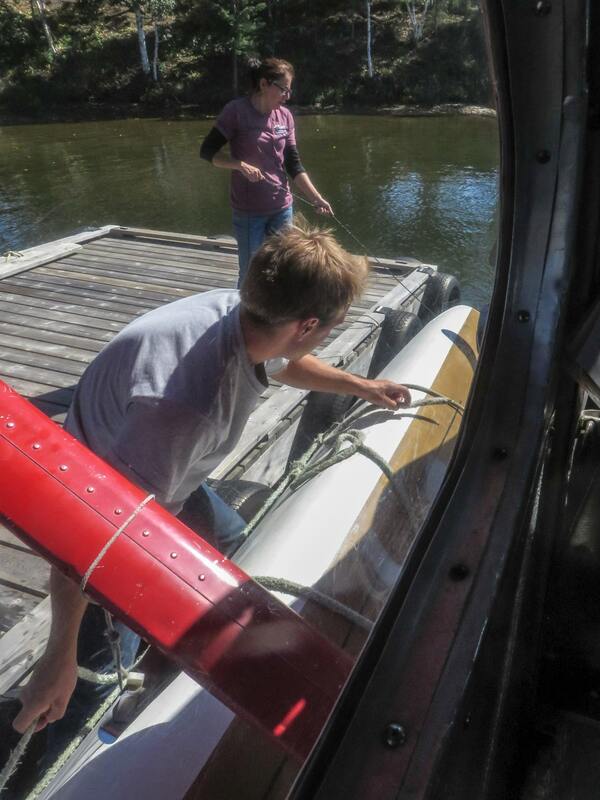 We first got to know Phil by his Canadian Canoe Routes handle of Voyageur. 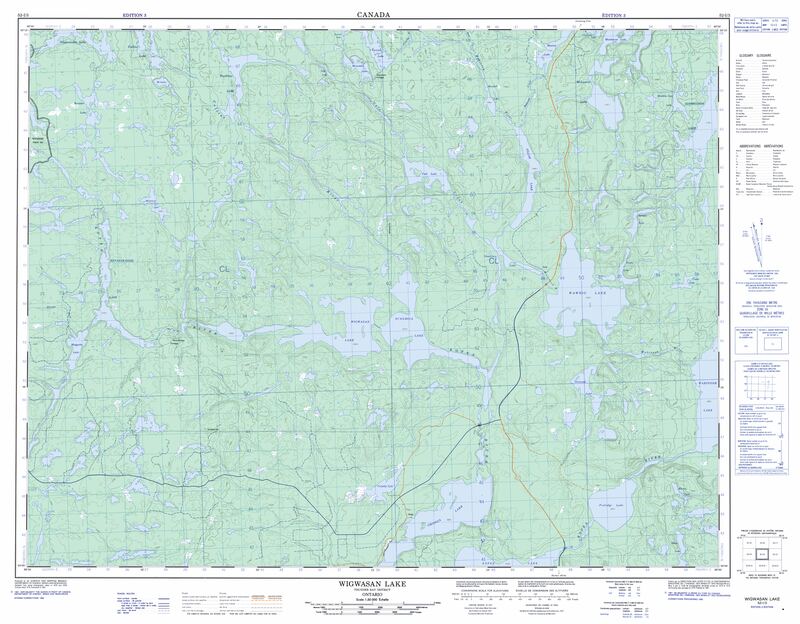 Back in 2010, he had made our entry into Wabakimi canoe tripping very easy with his ready advice and still unpublished copies of the first volume of the five map sets that his Wabakimi Project has since put out. 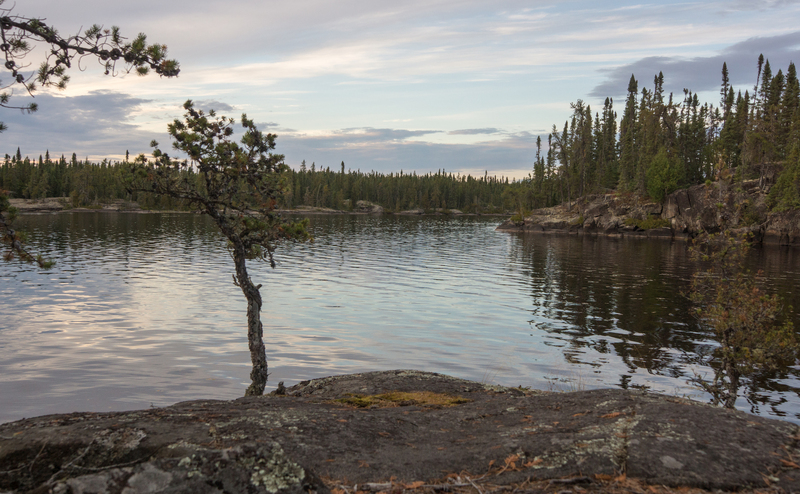 We had never even heard of Wabakimi and now we were driving 1600 kilometers to Armstrong Station and the slice of paddlers’ heaven that Phil had made his retirement project! 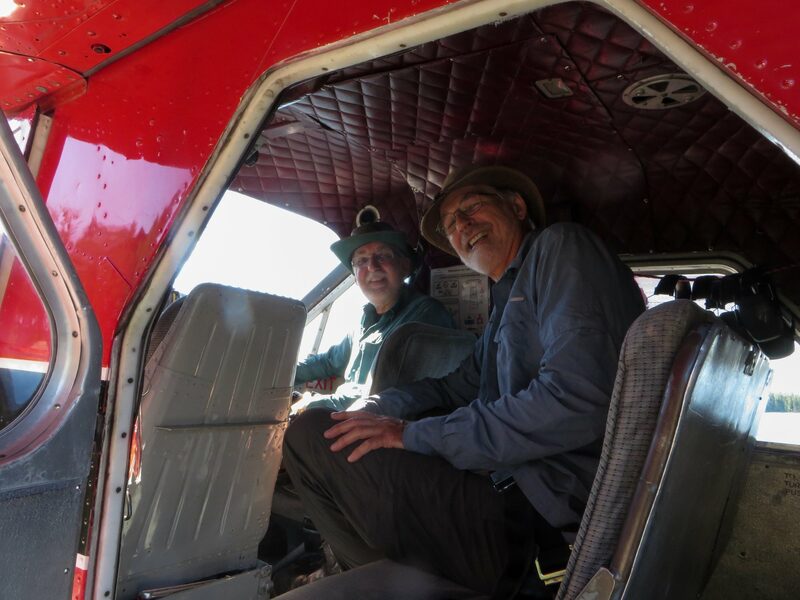 Three more Wabakimi trips in the summers that followed – and three more occasions where we got to benefit from the maps created by Project mapmaker Barry Simon and the portage clearing done by Phil and dozens of Wabakimi Project volunteer work crews. We joked that all we had to do was find out where Uncle Phil and his work gangs had been the summer before and make that our route! With this trip we followed after him once more – this time to Cliff Lake with an offering of a shot or two of Canadian whisky that we poured into the lake he loved most of all. We miss his keen and precise vision and direct no b.s. manner. He was an original. Googling his name will turn up some background info on his life and legacy. 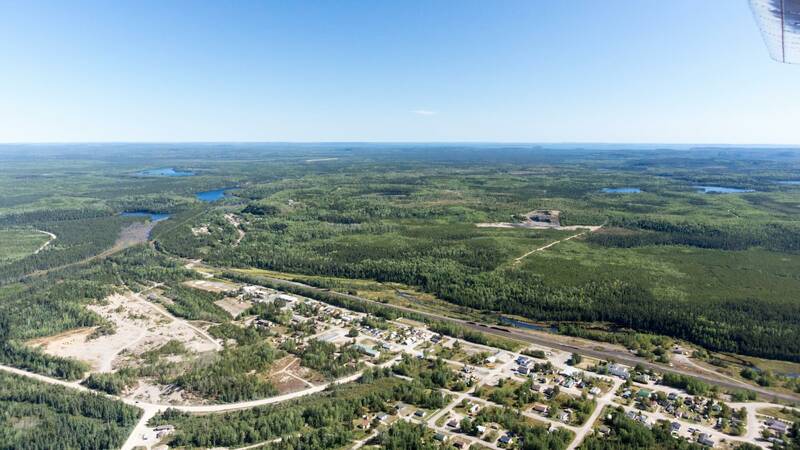 In this piece – My Turn: Phil Cotton – in On Nature magazine, Phil explains the motivation behind The Wabakimi Project back in 2004 and the Friends of Wabakimi that it has morphed into. It is a sixteen-hour drive (and 1600 km.) 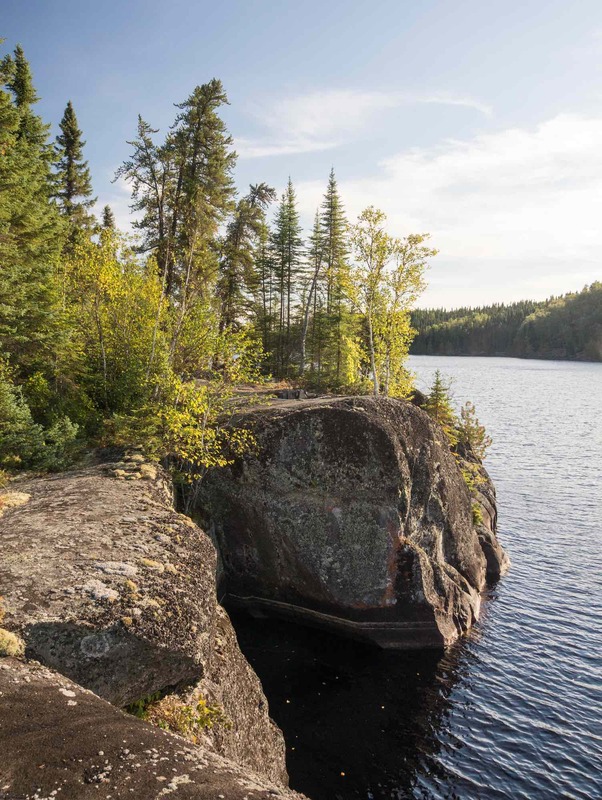 from southern Ontario to Armstrong Station, Ontario and one we have done three times to access our favourite slice of northern Ontario canoe country. This time we got to Marathon on top of Lake Superior around 7:00 p.m. on Friday, twelve hours after having left Toronto. After overnighting at the Airport Motel on the Trans-Canada, we finished off the trip with a 500 km. 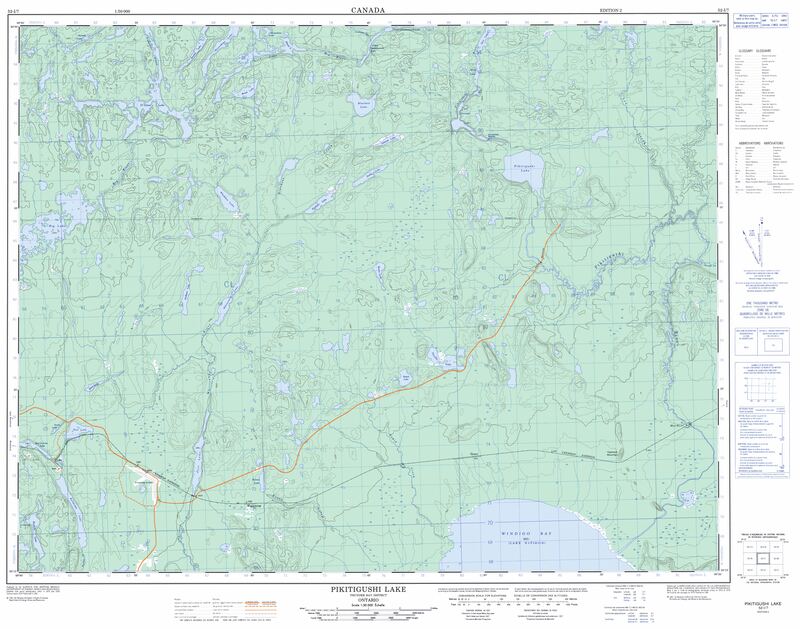 ride along some of the most scenic road in Canada – i.e., the section from Marathon to Nipigon. As we crossed the bridge over the Steel River east of Terrace Bay, we reminisced about our Steel River trip a couple of summers ago. Approaching the eastern outskirts of Thunder Bay, we took Highway 527 north up to Armstrong Station. [It is always a good idea to tank up before you leave the Trans-Canada since there are no gas stations once you get on 527.] There is, of course, a gas station at the end of the paved road at Armstrong Station. Before turning in at Mattice Lake, we continued up to Armstrong for a fill-up so that we’d have a full tank ready for our ride back south a couple of weeks later. We also had lunch at E & J Restaurant on Queen Street before redoing the 10 km. back down Highway 527 to Mattice Lake Outfitters. 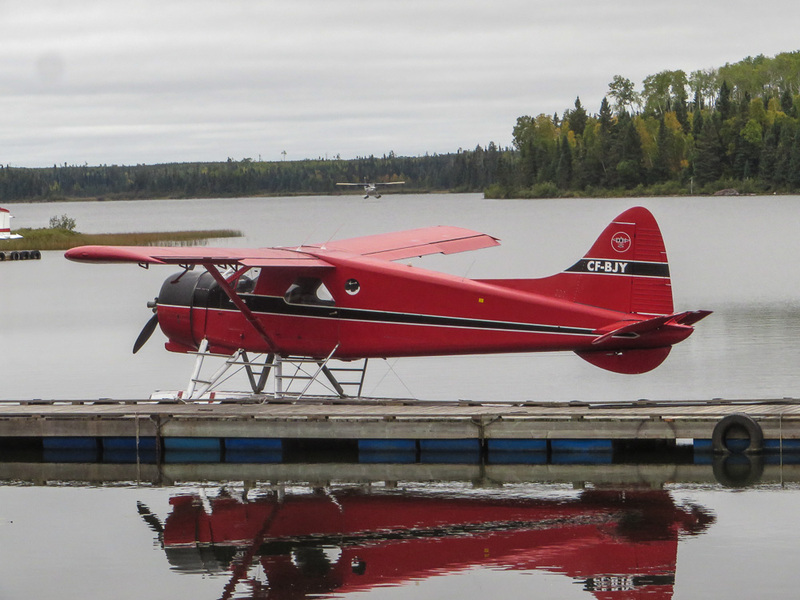 With our canoe strapped on to one of the de Havilland’s pontoons and our gear piled in the back of the plane, we made the less than 30-minute flight from Mattice Lake to Cliff Lake. 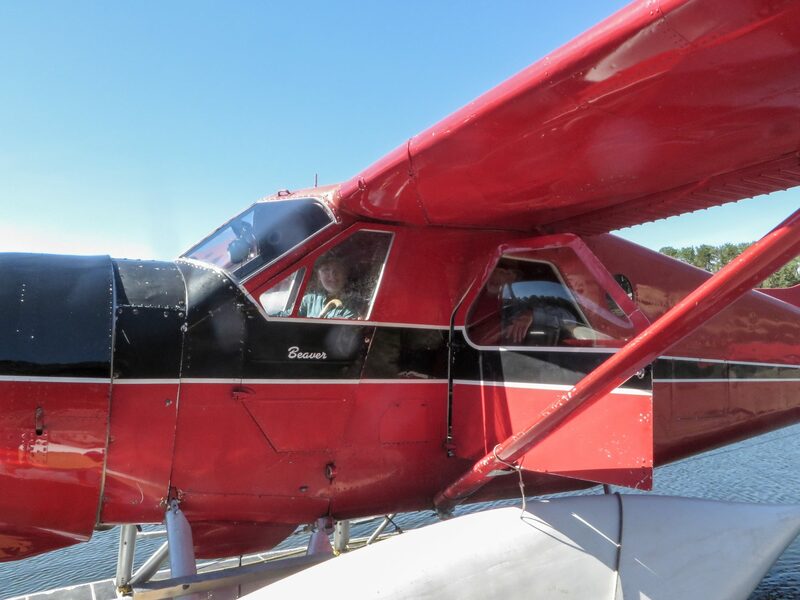 We had originally planned just to get shuttled to the Bear Camp off the logging road that crosses the Pikitigushi some 40 kilometers south of Cliff Lake and paddle up to the lake over a couple of days. We decided to splurge and, instead of paddling both up to and then back down from Cliff Lake, we had two days to spend on other water. Subtracting the cost of the road shuttle from Mattice Lake to the Bear Camp somehow made the $850. cost of the flight seem a bit less extravagant! de Havilland Beaver control panel – cutting edge technology from the 1950’s! We asked Yves to land at the north end of the long and narrow lake. We had set up camp on a point on the east side of the lake five summers ago which we remembered as an excellent spot. Perhaps it was the string of okay but not truly great campsites on our 2013 trip that resulted in our very positive rating for this Cliff Lake tent site? The view of the stretch of vertical rock on the other side of the lake was a plus! We found our tent spot – it is on the left side of the panorama image above – about thirty meters in from the shore. 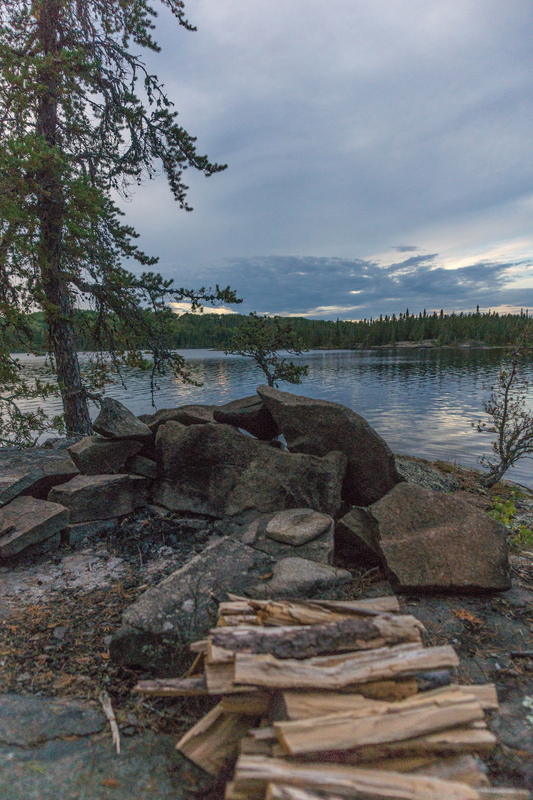 Just to the right of the canoe but not in the image is a rocky spit with a fire pit that makes for a nice place to set up the eating area and to sit and contemplate the lake and rock as dusk moves in. In retrospect, perhaps not the greatest campsite ever – but it was certainly nice to be back! 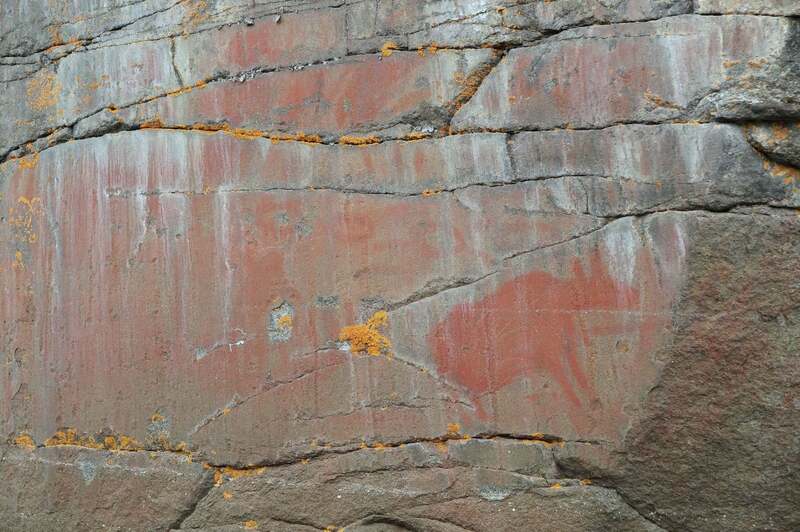 The main reason for our return was to see the Ojibwe rock paintings that had ignited our interest back in 2013 and continue to influence where we choose to paddle, intent as we have become on seeing more of the sites which have been documented and occasionally finding some that haven’t been. 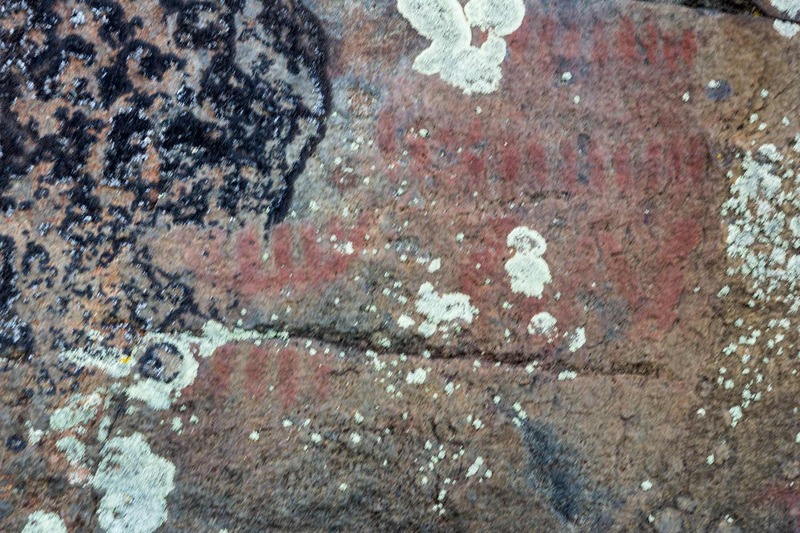 Selwyn Dewdney is the person most responsible for initiating the systematic recording and analysis of Anishinaabe rock paintings (i.e., petroglyphs or pictographs) of the Canadian Shield. 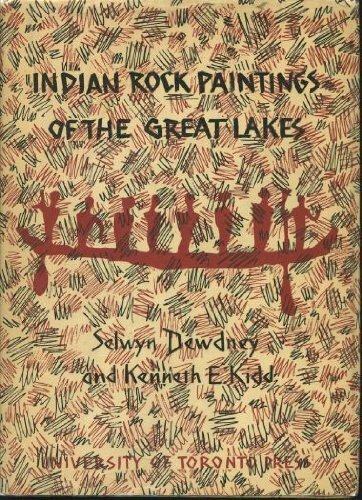 His book Indian Rock Paintings of The Great Lakes (First Edition) has provided us with a list of sites to visit and an introduction to the meaning of the various paintings. 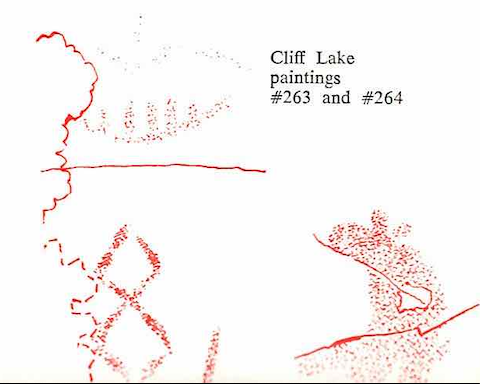 Download (here) the pages of Dewdney’s Indian Rock Paintings of the Great Lakes where the six Cliff Lake pictograph sites are described. N.B. In 1967 a second edition of the book was published. 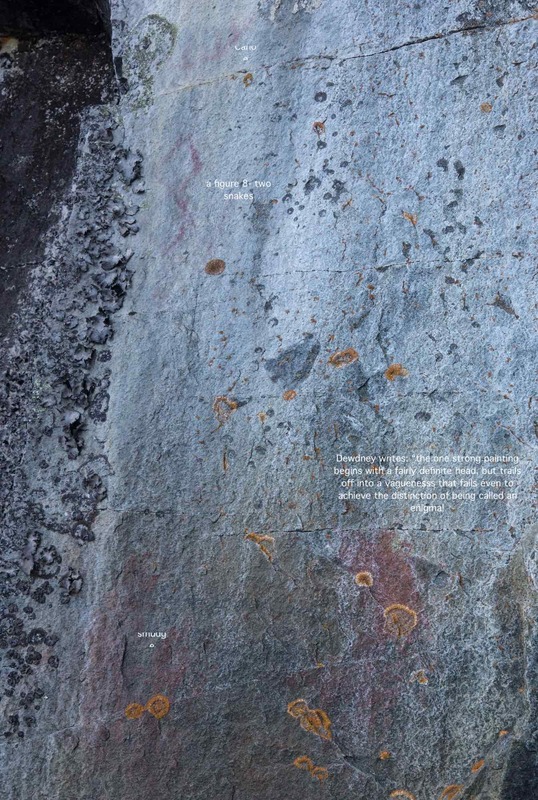 The Cliff Lake material appears in it but not in the first edition, a link to which is provided here. During the spring freshets, the waters of the Pickitigouching are said to be quite milky from the clay which they hold in suspension, and hence the Indian name of this stream, which signifies the Muddy River. The clay banks of the river beginning south of Pikitigushi Lake give the river its early season muddiness. South of the logging road the river has meandered its way through thirty kilometers of a massive glacial sand deposit which reminded us of the lower Steel River to the south of Rainbow Falls. 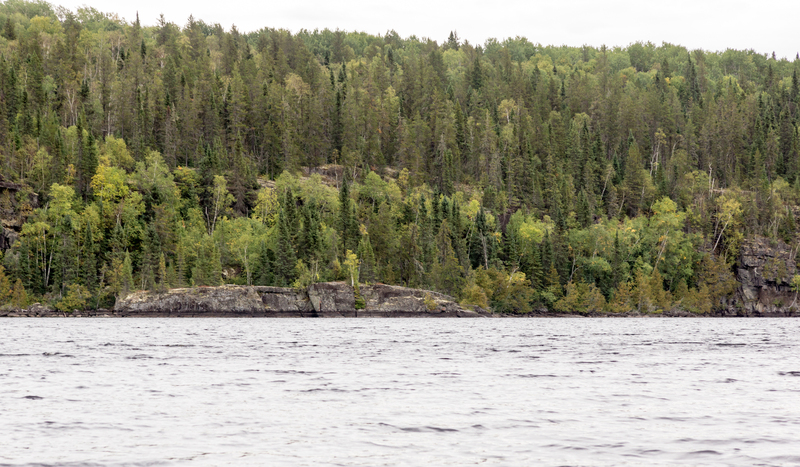 After we got the tent up we figured we’d revisit the two pictograph sites at the north end of the lake – Dewdney’s sites #264 and 263 – as well as check out the potential campsite on the east side of the lake across from site #263. In my mind, I was already writing a post that would highlight the four or five best campsites on Cliff Lake! On our way over to #264, we checked out the point across from our campsite which looked like another possible site. Ten minutes of tromping around later, we had to conclude that there was nothing there that would get us to stay and put up a tent! Off we went to see the pictographs. My shot of Face I is a good example of the A+ blur you can achieve when your camera is set at 1/30th sec. and you are sitting in a canoe bobbing up and down! 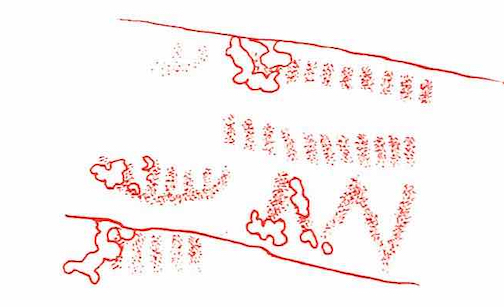 And here are some close-ups of a few of the images and smudges you will find there. 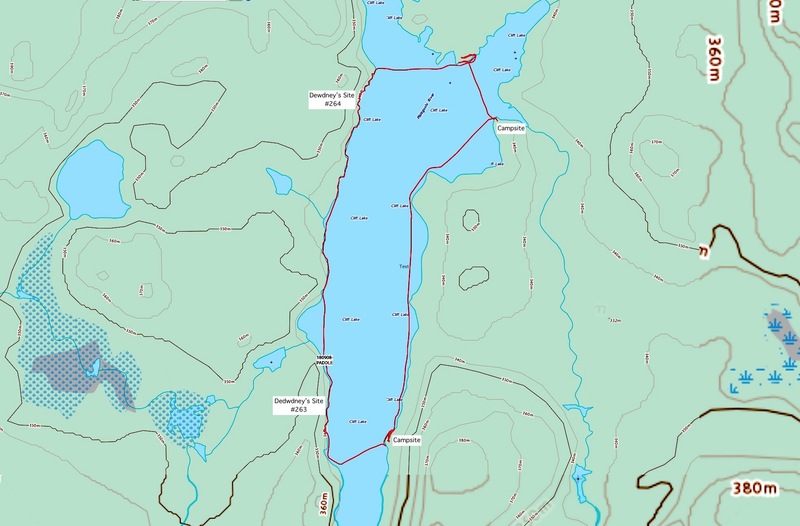 Our visit to the two pictograph sites at the north end of the lake done, we paddled to the other side of the lake to the potential campsite we had visited back in 2013. It sits on that fairly flat piece of rock outcrop about four meters above the water and is accessible from the north end. It is no more than a bit awkward to unload the canoe and move your gear the four meters up to the plateau if you choose to put your tent up there. You can see the campsite in the image below taken from Dewdney’s Site #263. What we found were a number of fair-weather two-person tent site possibilities with little shelter from the wind. Our four-person MEC Wanderer with its 2.5 m x 3 m space requirement would have had a home if we dealt with the deadfall that covered the one suitable area. However, given that it was more exposed to the elements than we like, we decided that – after all our talk about what a great site it was! – we would not be tenting there the next night! 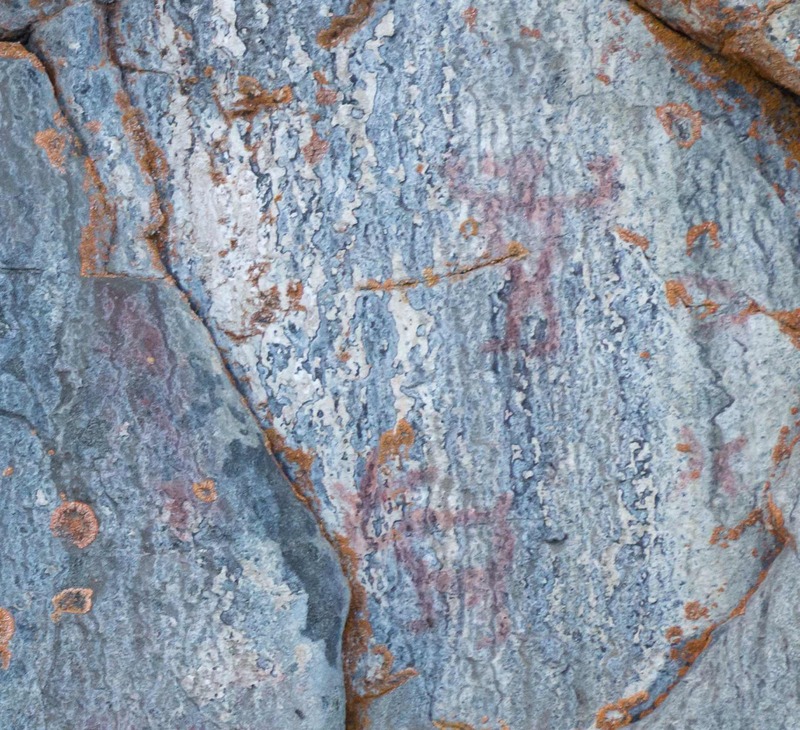 This entry was posted in Anishinaabek World, Pictographs of the Canadian Shield, wilderness canoe tripping. Bookmark the permalink. Thank you so much for your very thorough route descriptions. They’re not only great diversions as we enter the winter months, but they’re also informative. 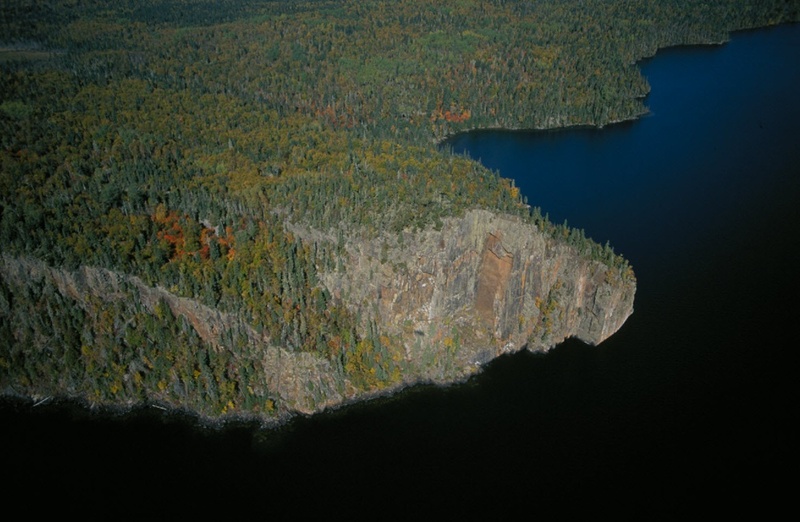 I’ve been eyeing Wabakimi for a few years and your recent entry on Cliff Lake has confirmed it for me – I’m going! I’ve got a question for you. I’m a hammock camper. In your experience, are there enough large trees that far in the boreal that I can hang from? Thanks. Looking forward to reading more of your adventures! David, nuthin’ like canoe trip seed time, eh! 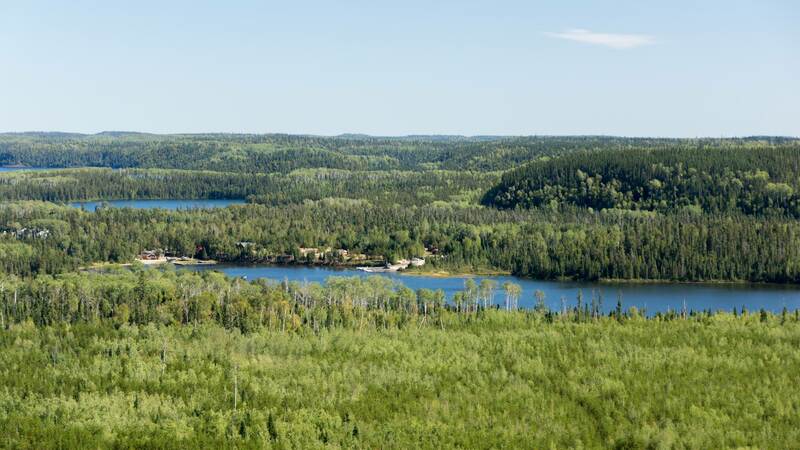 We’ve certainly enjoyed our trips up to Wabakimi over the past eight years and Cliff Lake is just one of the memorable spots we keep talking about. Having picked Wabakimi, now you got to narrow it down to one from a hundred different possibilities! 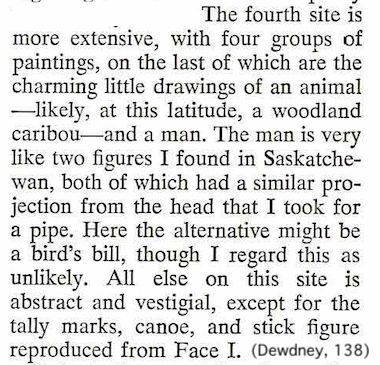 See an older post A Paddler’s List of Wabakimi’s Top Six for a subjective take. Re: hammock camping. Not an issue at all! In fact, you’ll have an easier time of it that we do thanks to our 8′ x 10′ four-person tent. Enjoy the planning phase of your next adventure! Personally, I love the campsite at the north end! Great view. Great “kitchen area” We put two smaller tents there just fine and stayed two nights. In the end, it is the best site on the lake! We really did not see anything better in our search for alternatives. Yes and it is nicely tucked away out of the wind. When we arrived there we were facing a stiff wind. 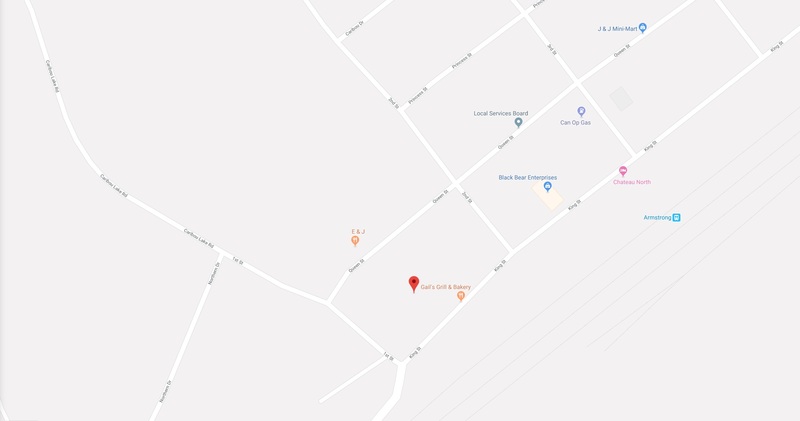 I was glad I had printed out your map showing where the site was. Even the short little paddle to the site was a challenge in that wind. If nothing changes there is a good chance I will camp there a night or two this summer. Not doubt I will think of you and your bro.